In Chantilly, France, Dior’s 2019 Cruise proceeded despite the weather. Hosted at the Domaine de Chantilly, a set of French stables, the models who bravely strutted their stuff were doing so in the pouring rain. No one broke their stride, though, and the stormy weather proved that even when wet, Dior’s latest looks are still stunning. 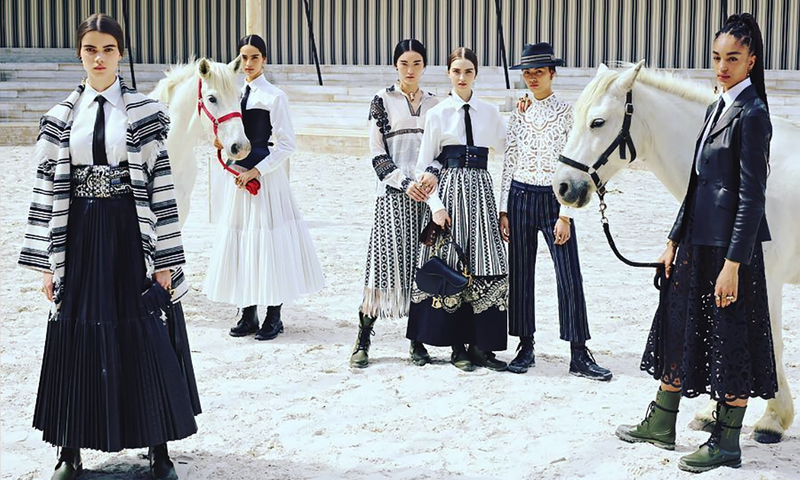 The fashion show, spearheaded by new Dior team member Maria Grazia Chiuri, was all equestrian-focused, in case you couldn’t tell. Besides taking place in a stable, there were live horses on hand. The models wore riding-inspired looks with elegance and beauty. If you couldn’t be there, here are some of the best looks to come out of the show. The black leather riding boots some models were sporting at the 2019 Dior Cruise were especially handy for providing traction on the rainy cobblestones. One model wore a pretty beige structured pantsuit beneath a white button-down shirt and black tie. The two-buttoned blazer was form-fitting but never tight, while the pants had a more relaxed fit ideal for horse-riding. Several models donned gorgeous long floral-patterned coats. Most of them also had riding headgear like black helmets, but those are optional. The coats were of various lengths, with some hitting the waist and others skirting down to the knee. Hues like gold, maroon, or rich royal blue mingled with these chic and functional outerwear options. Models wore shorts or trousers underneath, attesting to the coat’s versatility. Dresses and horseback riding may not go together, but the petticoat dresses seen at the Dior Cruise were perfectly aligned with Grazia Chiuri’s aesthetic. These dresses, often black and semi-sheer, had magnificent expanded skirts with seemingly endless layers. Large, waist-encompassing black leather belts were also a common sight on most of the Dior models. We mentioned one instance of a white button-down shirt with a black tie above. That was worn with a beige pantsuit. The white button-down shirt with black tie came up again and again, though. Sometimes it was worn with a strapless leather bustier and a white tiered floor-length skirt. Another model wore hers with a black and white shoulder shrug, an ornate oversized waist belt, and a black layered skirt. Yet a third model buttoned up a black leather jacket over her white shirt and tie. She finished it with a laser-cut patterned black skirt that hit at the ankles and—appropriately enough—rain boots. Header photo by @lusso_style on Instagram.